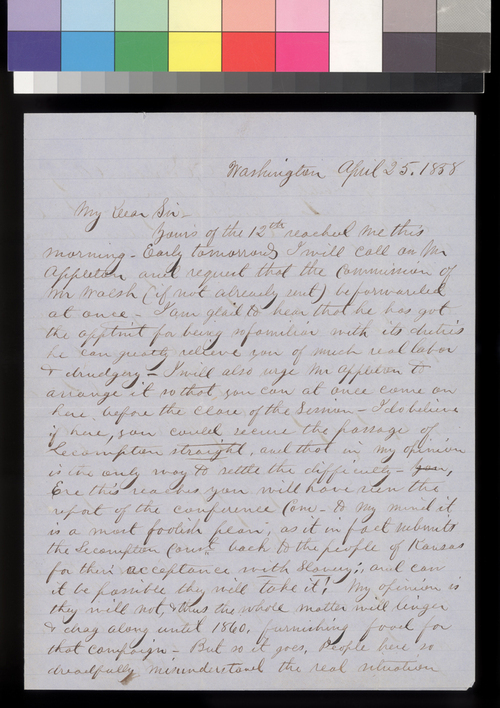 Robert S. Stevens, writing from Washington, D.C., to Governor James W. Denver, reports that Congress had passed the English Bill, which essentially resubmitted the Lecompton Constitution to a vote in Kansas Territory. Stevens predicts that Kansans would vote against it and that Kansas's admission as a state would be delayed until at least 1860. Stevens comments that legislators in Washington failed to understand "the real situation in Kansas," particularly the strength of the antislavery group in the territory.